Court says the group 'works for the interests of the terrorist Muslim Brotherhood.' 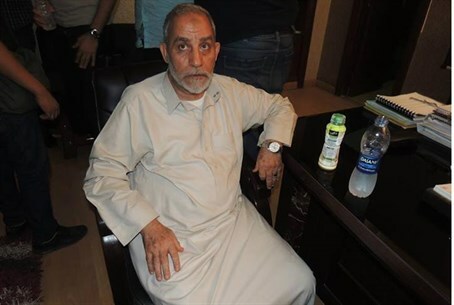 Brotherhood's Badie sentenced to life in jail. An Egyptian court declared Gaza's ruling Hamas faction a terrorist group Saturday, one month after a similar ruling against its armed wing, the Ezzedin al-Kassam Brigades. Another court sentenced Egypt's top Muslim Brotherhood leaders to life in prison, over a violent clash during an attack on the group's Cairo headquarters in June 2013. The decision by the Court of Urgent Matters declaring Hamas a “terrorist organization” follows deterioration of the relationship between the Egyptian government and Hamas after the Egyptian Army began sealing off remaining tunnels between Gaza and the northern Sinai, and demolishing structures along the border. Hamas' spokesman Sami Abu Zuhri said that Hamas does not accept the Egyptian court decision, which seeks to label the Palestinian people an enemy. In a separate trial, an Egyptian court sentenced top Muslim Brotherhood leaders, including the group's spiritual leader Mohamed Badie, to life in prison, for the killings of police officers and civilians during an attack on the group's Cairo headquarters in June 2013.